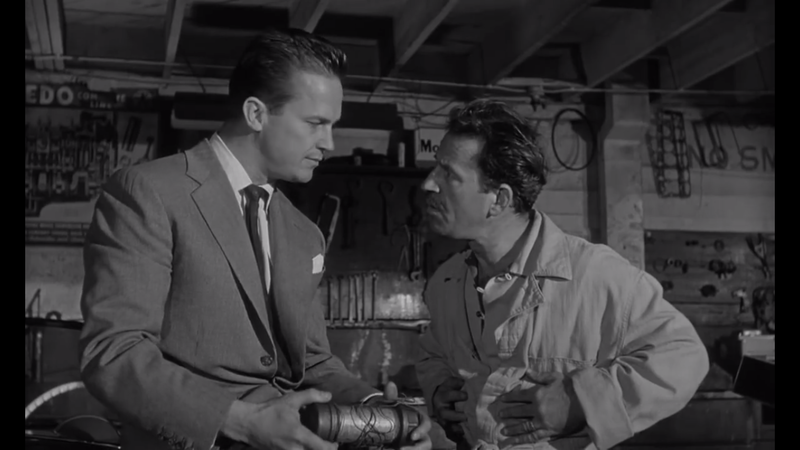 Set in L.A., the film stars Ralph Meeker as the callous and often corrupt P.I. Mike Hammer, adapted from the Mickey Spillane novels. One night while driving, Hammer picks up a frightened woman who begs him to remember her. They are forced off the road by thugs and the girl is eventually killed. Hammer wakes up in the hospital to his secretary girlfriend Velda (Maxime Cooper). He makes it his priority to find out what the mysterious woman was talking about. He meets up with opposition and a femme fatale, but Hammer keeps on going using strong-armed tactics. He finally tracks down a mysterious whats-it but then discovers that Velda was kidnapped. In the final confrontation, he finally learns who he was looking for and he finds out the consequences of the Pandora’s box in the hands of a deadly female. 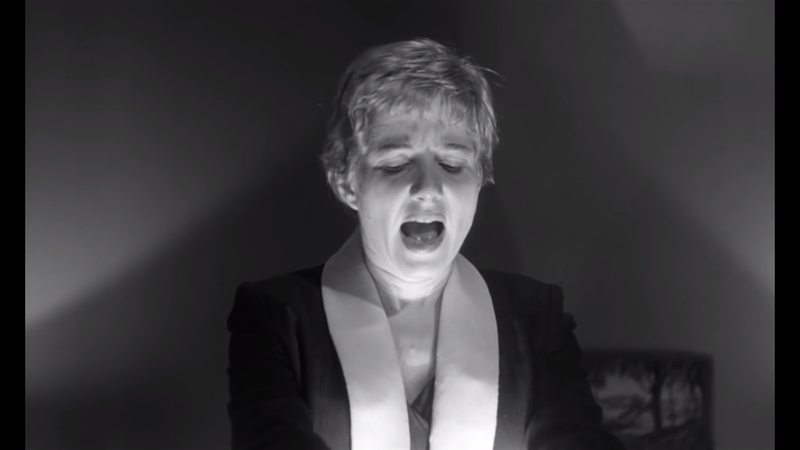 Out of most of the prominent works in the canon, Kiss Me Deadly is probably the pulpiest of L.A. Noir. The images are rather like a historical time capsule of 1950’s Los Angeles with locations on Wilshire Blvd., Sunset Blvd, and even near Angels Flight. It has crisp black and white cinematography with many noticeably low angles underlying the sleekness, but also the paranoia wrapped up in this story. It arguably has the queerest cold open and ending of any noir, which I cannot help but remember. Ralph Meeker plays’s Mickey Spillane’s P.I. Mike Hammer to a tee. His husky voice perfectly fits the bravado of Hammer, a misogynistic brute prone to coercive action. Out of all the private gumshoes we’ve met, Hammer is probably the lowest — he’s a real scuzzball. Hammer throws women around like playthings and even his girl Velda has a double purpose. Yes, she is a lover, but she also makes a keen asset for business. As a P.I. specializing in divorce cases and marital problems, he’s not below giving business a little help. Velda willingly works on the husbands for him and he’s not above playing around with their wives. It’s a cozy little set-up. That’s Hammer’s level and so when he gets caught up in the story of the mysterious girl Christina (Cloris Leachman), he has no idea what he gotten himself into. It’s a lot bigger than him and when the authorities throw around words like the Manhattan Project, Los Alamos, and Trinity he finally understands what its all about, but not really. 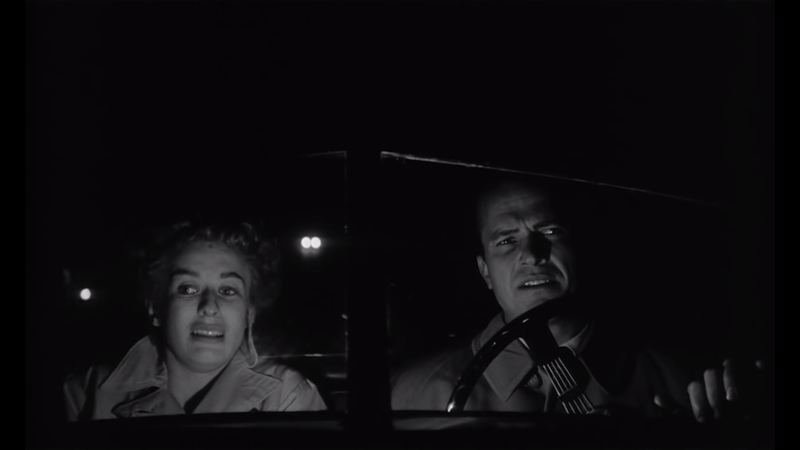 In essence, Kiss Me Deadly is the quintessential film of paranoia in the Cold War nuclear age. We have a MacGuffin in the form of the mysterious Whats-it, but aside from that, we get few answers. Only a few deaths and some mighty destruction. It’s an interesting dilemma because I have never loved Kiss Me Deadly, but director Robert Aldrich developed a film that is so persistently interesting. It was a film that was supposed to ruin young viewers for its moral depravity, sensuality and who knows what else. This film literally screams “Remember Me” and honestly I will not be forgetting about it anytime soon. Christina: You have only one real lasting love. Hammer: Now who could that be? Christina: You. You’re one of those self-indulgent males who thinks about nothing but his clothes, his car, himself. Bet you do push-ups every morning just to keep your belly hard. This entry was posted in 1950s, Crime, Drama, Film Noir and tagged Jack Elam, Jack Lambert, Los Angeles, Nuclear, Private Eye, Ralph Meeker, Review, Robert Aldrich by 4StarFilmFan. Bookmark the permalink. Do I love this film, I have it in my collection. Saw it twice still the greatest film ever. Nice review. “Persistently interesting” is a perfect description for this movie. I always come away from it scratching my head, but who cares? Usually a convoluted plot that doesn’t seem to be fully resolved drives me crazy, yet this film always fascinates me. I think it’s time to watch it again! I love it, the characters, the locations and that plot of death and destruction.